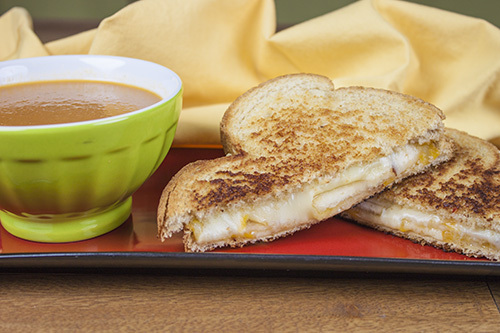 Tomato soup and grilled cheese are a match made in heaven, especially when you make them from scratch and include plenty of habanero peppers! Butter the Italian bread slices and set aside. To a food processor (I used a molcajete), add habanero, onion, olive oil and salt and pepper. Process or grind to combine to a paste. Chop all the cheeses into a mixture and set aside. Heat a large flat pan to medium-high heat. Spread habanero paste over the non-buttered bread slices. Grill bread slices butter side down. Cook about 2-3 minutes until they are crispy and brown. Set bread slices onto a baking sheet and Divide cheeses over the paste spread. Bake for 5 minutes, or until cheeses are nice and melted. Remove from oven. Set pear slices over cheeses and combine the slices into 2 sandwiches. Slice into triangles and serve! We served ours with our own Jalapeno-Tomato Soup – see below. Heat a sauté pan to medium heat. Add olive oil with jalapeno peppers, habanero, garlic and onions. Cook about 5 minutes, or until ingredients are softened. While the above is cooking, heat a large pot to medium heat and add butter. Allow butter to melt. Add flour to butter and stir to form a roux. Cook about 5-6 minutes until nutty brown. Add peppers and onions to the pot and season with salt and pepper. Stir. Add chicken broth and stir. Bring to a light boil and reduce heat to simmer. Add stewed tomatoes and chili powder and simmer about 10 minutes. Use an immersion blender to process the soup. You can also transfer the soup in small batches to a blender to process and return to the soup pot. Process until smooth.